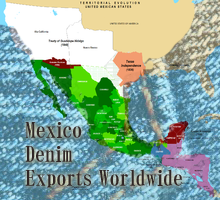 Mexico is one of the important centers worldwide producing both denim fabrics and garments. Its proximity to US , benefits of trade agreements like CAFTA and its strategic location between the two Americas also contributed to its growth as a textile and apparel centre . Top 14 countries to which Mexico shipped denim fabrics in 2011. The Volumes of those shipments and the average prices of these shipments. The total denim shipped in this period. A bar graph which shows the different markets of Mexico . A brief note on the top top two countries where Mexico has exported and what’s happening on denim scene there. 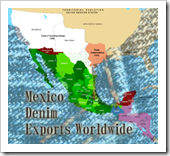 We will be publishing report on imports of denim and info on some buyers in Mexico shortly.